You must create a new GST Suvidha Provider (GSP) for E-way Bill generation. A GSP is a service provider who provides support to a person or a business through its web platform. This support pertains to compliance with the provisions of GST. In our case, the GSP is Alankit Limited. Let’s look into the process of E-way Bill portal (NIC) log in and adding GSP. Open the E-way Bill system portal through URL https://ewaybill.nic.in and click on the Login button. If you are already registered in the NIC portal and fill the “User name”, “Password” and the Captcha. 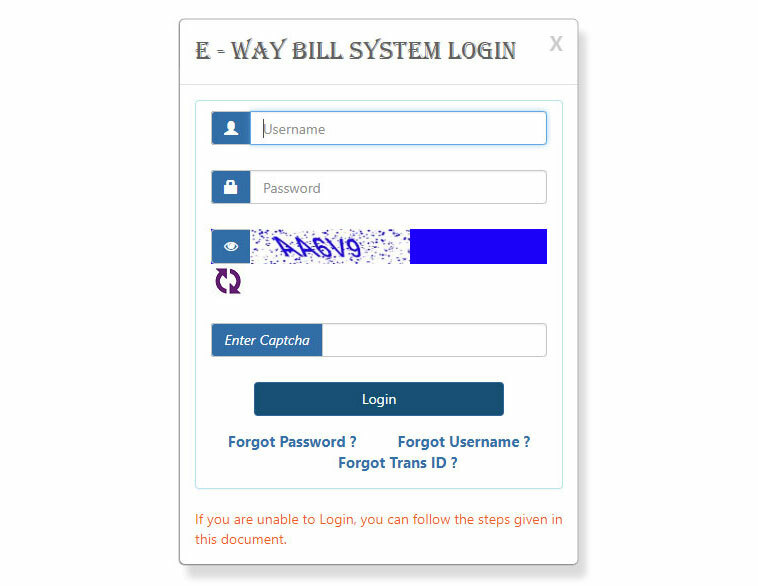 The E-Way Bill System Login screen is included below for your reference. Open the E-way Bill system portal through URL https://ewaybill.nic.in and go to the “Registration” dropdown and select "E-way Bill registration". Now you have to enter your GSTIN and the correct Captcha Code and hit the “Go” button. You will now be directed to the e-way bill registration form with your details auto-filled, based on the GSTIN provided by you. Click on the Send OTP button, enter the OTP so received on your email address and then click on the Verify OTP button. After successful verification, you are eligible to create a new account in the e-way bill. The next step would be the registration of GSP. After your successful login, click on the “Registration” tab appearing on the left side menu of the homepage. In the drop-down list that appears to select the “For GSP” option. Select "Registration" > "For GSP"
“Register your GST Suvidha Provider” window gets displayed. Click on the “Send OTP” button, enter the OTP so received and then click on “Verify OTP” Button to verify the OTP. You will be auto-directed to the next window on successful verification of the OTP. In the next window, select “Add/New GSP” option to add your GSP name. In the "GSP Name" field, select Alankit Limited from the dropdown. Then enter any three alphabets of your choice as a suffix to create a unique username for your GSP, twice. Also, to be entered twice is a Password not exceeding 15 characters. GSP’s unique username and password will later come to use for NIC credentials. Click on the "Add" button and your new GSP is created. You can then select the "View" option post successful creation of your GSP to view the list of all the GSP’s registered by you.